A hen party is something every girl anticipates before her big day. You can plan a wild party with lots of drinking and dancing or maybe just a tamer version of it, with a day of drinking champagne at a relaxing spa. In either case, whether you have a roomful of friends or just a handful when you go out to celebrate your last moments of your single life with your friends, you need as much attention as possible. You want to tell the world what you are out celebrating and there is just the perfect accessory to do so are hen party badges. If you want the bride to stand out a little more than the rest of your group, you can get her a customised hen night rosette, as well. Having the proper accessory for your hen night can make all the difference to that one night. 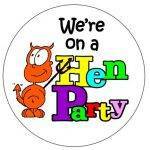 Personalised hen party badges can be a fun way of promoting the event with a wide range of humorous, naughty, and even classy hen night badges to choose from. What’s more, if you want to get your own design from our range of personalised hen night badges, you c an do so with just one call. Shape, size, design and content can all be altered to fit your requirements for the perfect badge. Custom Party Wear has loads of design options for your Personalised Hen Party Badges. To Check out the designs, visit our order pages to complete your order. We have hundreds of designs that you can choose form , or suggest a design yourself. The most popular size is our 57mm diameter badge. This is a great choice for the guests and in the majority of cases, also for the Bride. 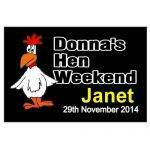 If you want something a little bigger for the Bride then we have the 77mm diameter version of the hen night badges. If you don’t want to wear your badge on your clothing then we have the option of ribbon badges, which can worn around the neck. We also give you the option of adding extra personisation by having the ribbon printed. Any badge can be used – but we would suggest the 77mm gives a better effect. You have a choice of ribbin colours , and of course what ever next you want. Our heart shaped hen night badges are a novel variation on the more traditional badges.They are approximately 50mm across the widest part of the badge. Here are just a few of the more popular questions. Email us if you still have any queries before you order. Can I add a photograph ? No problem. You can either attach it to an email or you can upload it when you place the order. We can clean it up if there are other people in the background. If the photo is only in hard copy then we can scan it and return the photo with the order. Yes we can, but we can only offer next day delievries in the UK . For ROI and the rest of Europe we can use a courier which takes between 2-3 days. For the rest of the world we use airmail or Express airmail. We can quote for this if you send us your requirements. 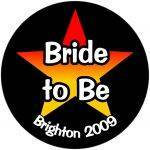 Do you have an option for hen night badges so I don’t have to pin it on my dress ? Do I have to pay extra if I want a special badge for the Bride? If you want a specially worded badge for the Bride then we just charge as if it was just an extra badge that you were buying. There is no supplement to pay for the different wording or different design. Just tell us what you want when you order.